Quark (Armin Shimerman), in his new role as the Grand Nagus, takes a walk on the Promenade with his brother Rom (Max Grodenchik). Oh, the yearly Ferengi episodes. It will become a regular presence during any given DS9 season. Few would be good. Most would be train wrecks. Fortunately, the original DS9 Ferengi episode, “The Nagus”, was one of the better ones. Comedy is hard enough. Doing comedy on a sci-fi television show is even trickier. There is the danger that the humor could go so far that the entire premise of the show could look completely stupid. When comedy is done well in sci-fi, as on ‘Farscape’ or ‘Firefly’, it is wry and smart. When it fails, particularly in the various Star Trek series, it can be attributed to the writing. A Star Trek comedy episode is very old fashioned, almost vaudevillian, which isn’t too surprising considering the amount of stage actors the franchise employed. There’s a real lack of sophistication and an abundance of cliché. You can almost hear the “whan-whan” trombone at the end of each gag. 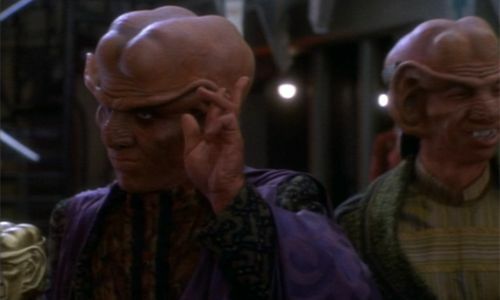 What helps “The Nagus” is that it acts as one of the better windows into the workings of Ferengi society. We learn that despite being the ultimate free market society, there is a sort of CEO of the government, the Nagus. When the Nagus apparently dies, his remains are vacuum desiccated and sold as collector’s items. When Quark is made the new Grand Nagus, we are treated to funny homage of The Godfather. The casting of Wallace Shawn as the Grand Nagus is very inspired. Despite being buried a ton of makeup, he is able imbue the character with a lot of life. The only thing I can’t stand in his performance is that high-pitched laugh. Oh, it grates. Armin Shimerman has been one of the best actors on the DS9 so far this season. Unfortunately, this episode requires him to get a little too over the top at times. Quark’s begging Rom to spare his life is played more for laughs than desperation. Still, anytime Quark and Odo are in the same room, we’re almost always guaranteed a fun scene. Max Grodenchik as Quark's brother and Nog's father, Rom, is another story. I know the character is supposed to be constantly put down by his brother, but Grodenchik makes Rom a stammering, bumbling mess. After a handful of episodes, Colm Meaney returns to the show. Outside of DS9, Meaney was very busy as a movie actor during this period. O’Brien is one of my favorite characters, as well as one of the show’s best actors, it’s always great to see him on the screen. Being the other dad in the ensemble, Miles works as a good foil to Sisko’s own parenting hardships. “The Nagus” is not a bad episode. Unfortunately, it does set up a trend that will become an annoyance once or twice a season on ‘Star Trek: Deep Space Nine’. This episode works in that we learn more about the Ferengi. Also, we get to see Sisko continuing to learn at being a single father to a teenage boy.